We always have a bit of a lull in the autumn; the summer is so full on, that we just can’t keep that pace up continually – for me, in addition to a full time job. 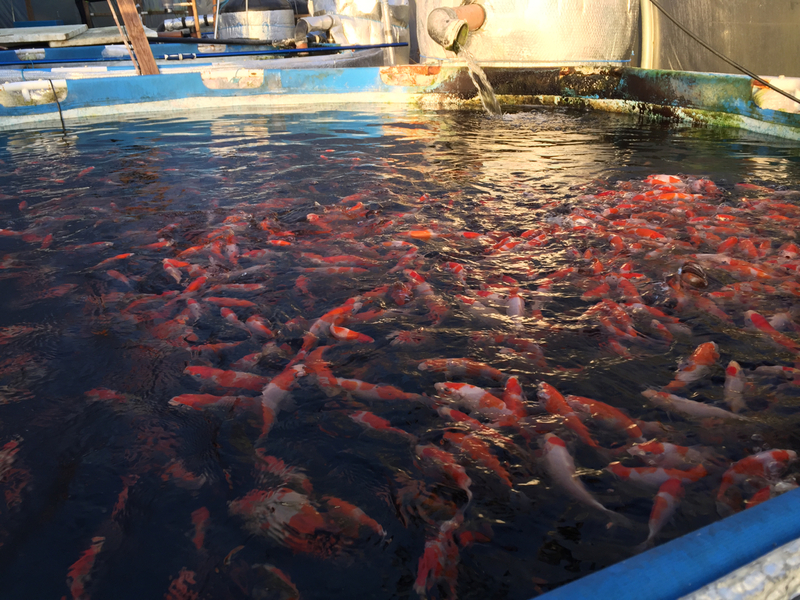 On the flip side, there isn’t much time to take our foot off the pedal at such an important time for the yearling koi without affecting their tosai prospects. And, selection of the babies from our 3 step female’s May 17 spawning has been hanging over me for some weeks now; and it’s a concern because growth has been compromised significantly by us not selecting the numbers down earlier. 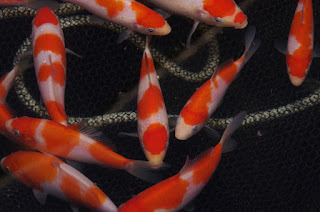 The decision as to when to select has been slightly complicated this autumn – firstly, because in the 3 step spawning we’ve had a lot more patterned kohakus that we usually get. 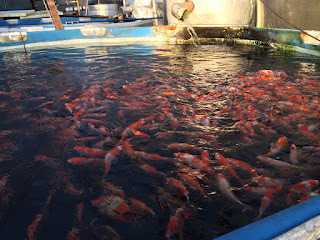 And, secondly, because of that – we’ve been looking to set up two new tanks; one for nissai, and another to act as an additional tosai growing on tank. 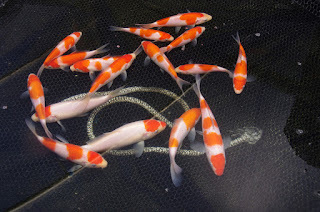 The new tank has taken at least a month longer than I expected to set up, and my weekend time for koi over the last few weeks has been split between prioritising time towards setting the new tank, and also allocating time to regular husbandry aspects. 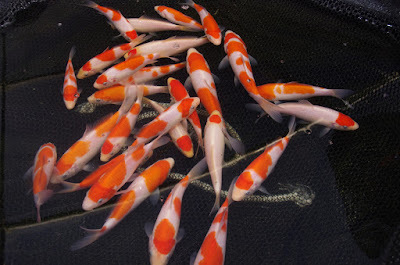 The new tank isn’t quite ready to take koi, and with growth suffering as a result of the delay to the new tank, I decided last weekend that I could wait no longer – and rather than complete the new tank so I could split the small koi from the 3 step female into two tanks; I prioritised selection to whittle the numbers down and provide space for the keepers to grow on that way for few more weeks in their current tank – and then decide whether to split them when the new tank is up and running. We bought two tanks from aquosis a few months ago – the one that is almost fully set up (I’ve been taking pics during the build, and I’ll write the build up in fully detail on a separate blog post), and we have one more waiting to be set up – and this autumn, having changed our overall project objectives – as I discussed in my blog update ‘Weekend koi farmer’; I am considering what the most cost effective approach is for our expansion. And, once I decide on that, we’ll know where to set up the second tank. Amanda and I seine netted as normal, and then my eldest daughter came out to help me with the selection. 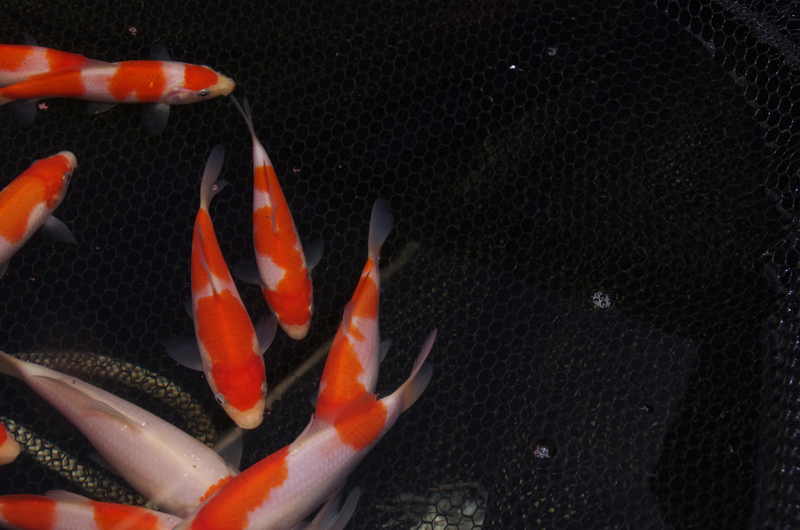 Annabel has a genuine interest in the koi, and she’s become a great help. 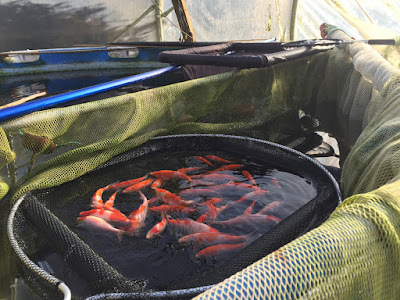 I also have in mind that if we’re to strive towards our new headline objectives – I am going to need more in house help ; as we scale up, all being well… there will be a lot more fish to select through in subsequent years and I will need some help. Annabel is also enjoying the pocket money earning potential !! I found this selection quite difficult at the start. The aim was to whittle the numbers down considerably – but most of the fish were at least as good as fish I’d kept over the winter in previous years. So, after a few pan nets worth – you kind of get your eye in, and I make a personal decision about which characteristics I will select on to achieve the reduction, and I targeted to reduce the numbers by half and set my selection criteria accordingly. 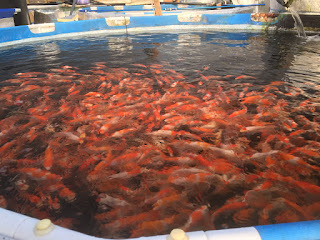 I just about managed it, taking around 450 fish out of the tank – which housed around 1000 at my last count. 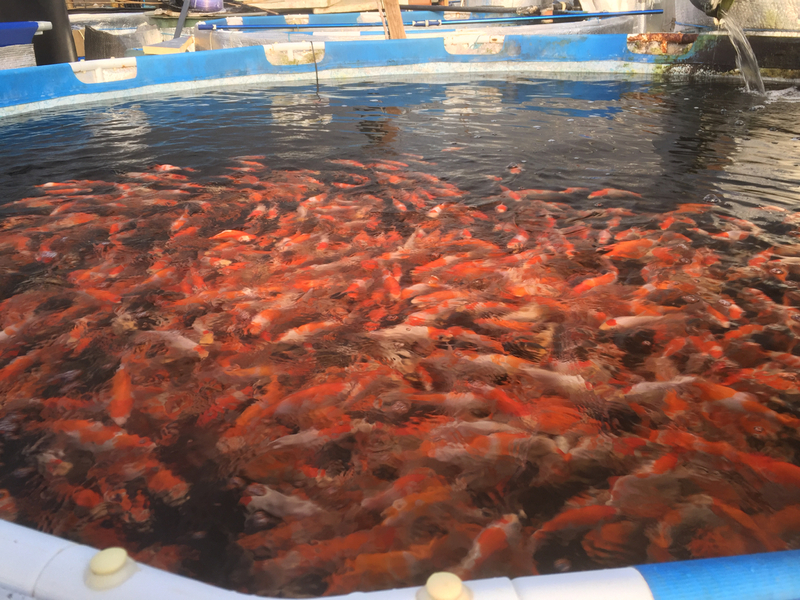 The remaining 550 or so is still way too high for an optimised grow on stint; but with the new tank almost ready… I can take a week or two to finish it off, and will then split the 550 across two tanks to optimise growth to the tosai selection point in April. The end result is very promising. Some of the body shapes are really exciting – particularly on the head area which I always look at first. Skin quality is, on average, looking at least as good as our best efforts to date - and possibly better. The next 2 or 3 months growing stint will be very interesting. Lots of visitors look at the red , and comment positively about the vivid colouration of these babies – and they do look good on the whole. And the quality of the red is reassuring currently. The bodies are good enough on a few of them that I’m fairly sure we will have some show prospects for 2018 out of this lot. the 4 step... bottom right in this picture, continues to develop well. the white is good, and the pattern is great.. albeit the red comes onto the nose. 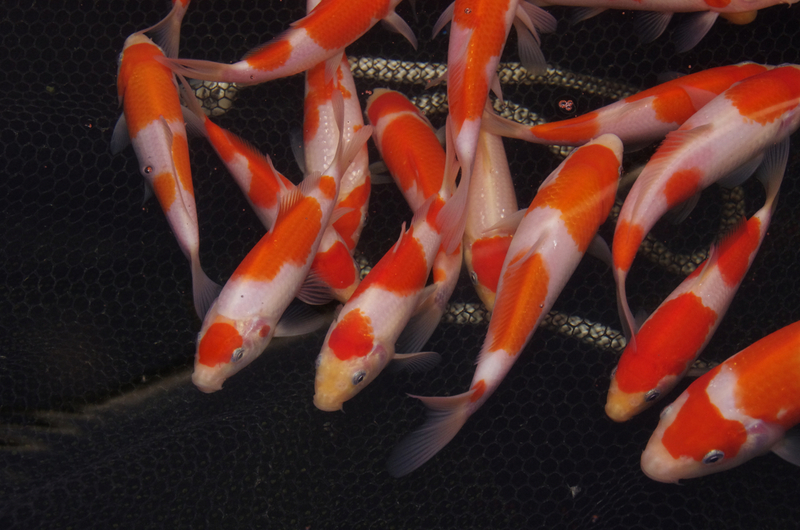 it's one to watch, and you dont find many nicely spaced out 4 step pattern Kohaku's although, I think this one may end up as a 3 step. 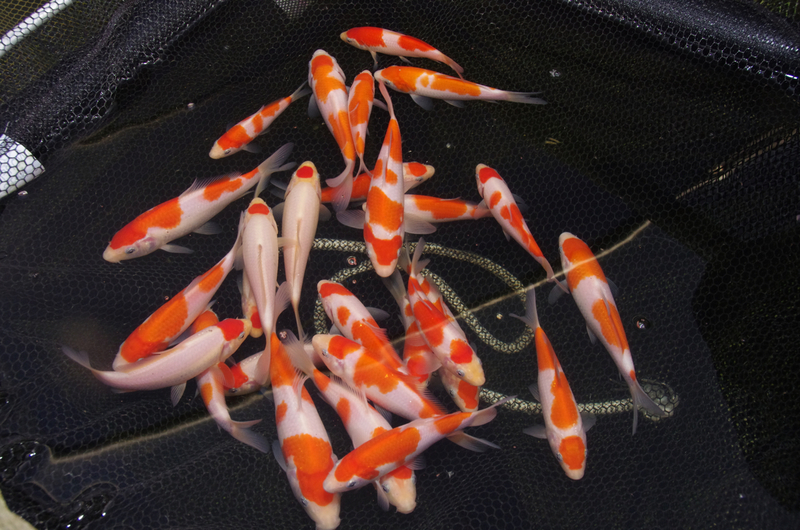 the middle two markings could join up on the koi's right hand flank. the two step shown here is one of the better ones; not the largest, or smallest. 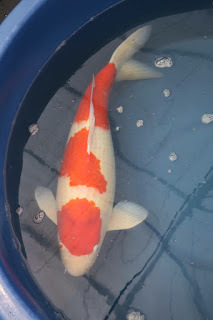 the red is deep and consistent; and the body isn't too slight. i would have liked a little more volume ideally - but at such an early stage, i'd cite this as one to watch. 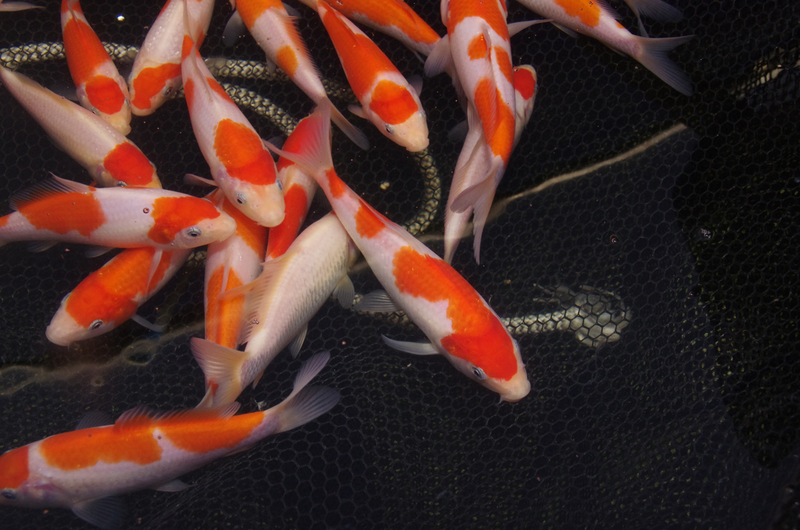 this one (in the middle of the pic; the left hand most fish) - i'm going to predict this ends up as one of the best from the spawning. other siblings have better patterns, but this one has a great head pattern and overall the pattern takes you from front to back. there's a little bit of white at the tail stop - it would be great if that expanded. this is one of the better growers, and the white is good. as an overall package of attributes - I'm very hopeful for this one. we've ended up with quite a few Tancho from the 2017 season; both in this spawning and the May#1 spawning too. 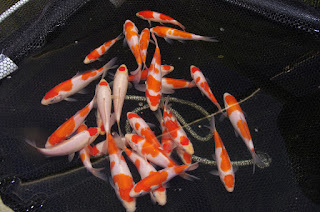 I'd forgotten how many we took through at the last selection, and I think we may have something like 10 or so, good Tancho's. With such a great result from the 3 step female, that's the one from Takigawa that we bought from Yume koi – we have decided to finally give her a name. From now on, she's called 'Rosie' . It just felt like the right time to name her, and we ended up with this name which has a certain grace about it - she contrasts nicely with our other named female, 'Sharkey' - who is far more butch; and 'Rosie' also derives from the word, 'Rose' - and that just felt right given her lovely red colouration, and indeed her white colouration too is really good - so deep, and thick. Like a rose! She took a knock in the spawning earlier this year which scraped some of the red pattern off her head. no effect on her well being - or her potential as a brood fish for us, but it means she doesn't look quite as blemish free anymore. There’s not much time to wait until the next instalments our end; we’ll be going through our females tank before Christmas – and this year we'll measure up the females to see how they're doing. And, the main interest will be the nissai that we’ve been growing on in that tank through the autumn. 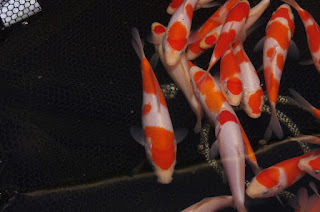 I need to start cooling the tank down soon - probably in the next few days - and that will be the end of growing our nissai on this winter – until I can get another new tank set up!! And that’s not going to be imminent. 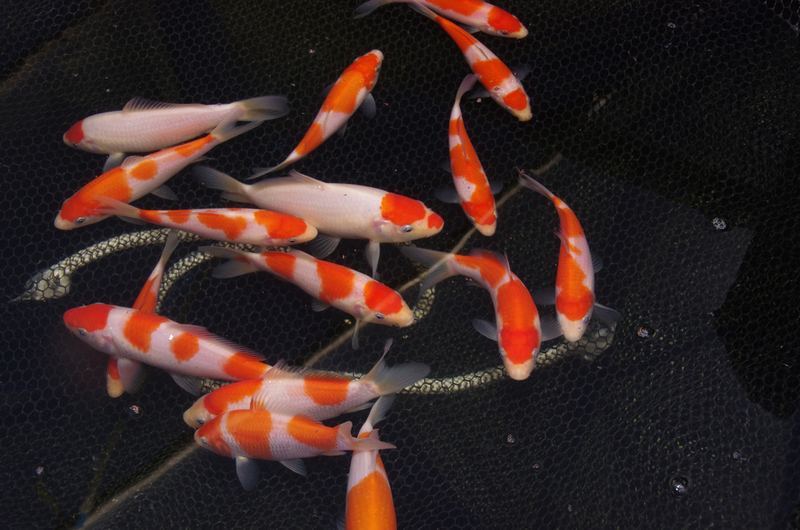 In other news... the babies from our late summer spawning are around 3 inches long now, and approaching their next selection. This will either happen just before Christmas or more likely, early in the new year.